An exhibition of photographs by David Quentin and text by Robert Mcfarlane. 4 Windmill Street is delighted to present a recent collaboration between photographer David Quentin and bestselling travel writer Robert Macfarlane. Silt – one of the most striking chapters of his recent book The Old Ways (2012), sees Macfarlane walk the Broomway, notorious as the “deadliest path in Britain”. Quentin documented this atmospheric journey along an Essex offshore path that has claimed the lives of more than sixty people over the centuries. 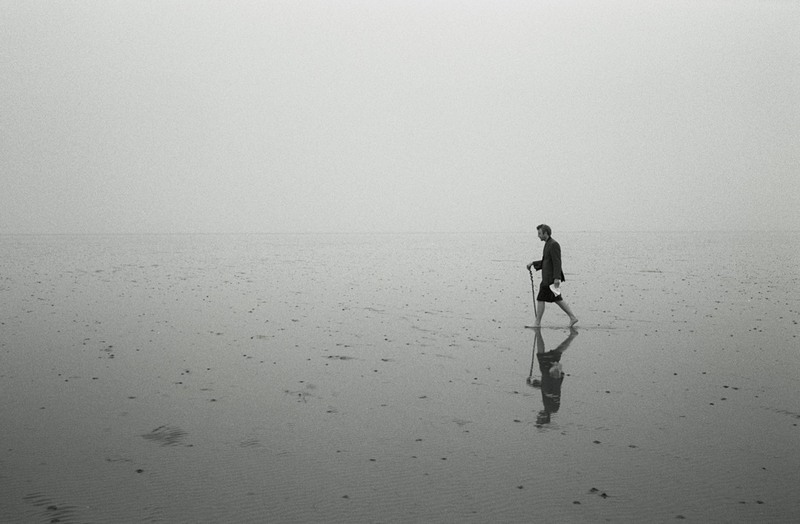 David Quentin’s photographs of the walk are now to be published by Penguin Books in a special e-book edition of Silt. The photographic series reflects upon this disorientating mirror-world and show the transition from purposeful walk to an isolated end – at the mercy of a great optical expanse. Quentin’s work with photographic film; generally using vintage camera equipment, documents various kinds of human intervention in landscape. His photographs have appeared in publications as diverse as The Financial Times and Artrocker Magazine. Robert Macfarlane’s third book, The Old Ways was a Sunday Times Top 5 bestseller and short-listed for the Samuel Johnson Prize (2012) and Waterstones Book of the Year Award (2012). Robert Macfarlane (b. 1976, Oxford) is a writer, critic and academic. After studying at the Universities of Cambridge and Oxford, and teaching in Beijing, he was made Fellow in English Literature at Emmanuel College, Cambridge, in 2002. Macfarlane lives and works in Cambridge, where he teaches and lectures on Anglo-American fiction since 1945, post-modern theory, literature and environmentalism, and the history of the novel. A sound performance by musicians Jimmy Cripps and Rico Borza, with sound designer Jesse Rybolt, accompanies the exhibition opening. See http://www.silt-exhibition.com for more details.